Cousin to brunch, brinner is breakfast-style dinner. This super delicious strawberry rhubarb French toast is going to crush brinner. And breakfast. And dessert. Why? 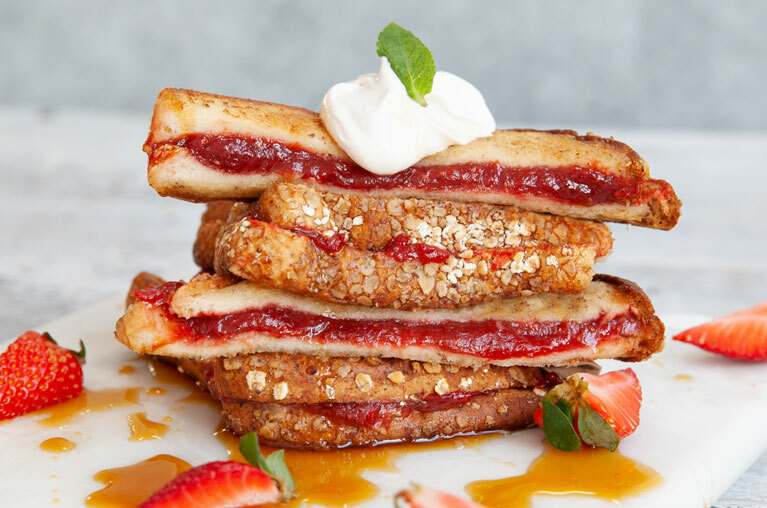 This is the first French toast we’ve made with our amazing new Sprouted Honey Oat loaf, which is baked with sprouted whole grains and oats for enhanced nutrition and easier digestion. The subtle sweetness of honey draws out the notes of strawberry and rhubarb even more. Enjoy! In a medium saucepan, combine the compote ingredients and bring to a boil. Lower heat to medium low and continue cooking until thick and jammy, approximately 20 minutes. Cool completely. Make the soaking mixture. Combine the coconut milk, ground chia seeds, maple syrup and vanilla in a shallow bowl. Assemble the French toasts by spreading half the bread slices with the cooled compote. Top with remaining slices. Working with one sandwich at a time, dip both sides into the soaking mixture and place a preheated non-stick pan greased with butter. Cook until golden brown on one side, flip and continue cooking until the second slice is brown. Repeat with remaining sandwiches. To serve, mix the yogurt, sugar and vanilla in a small bowl and dollop over French toast.